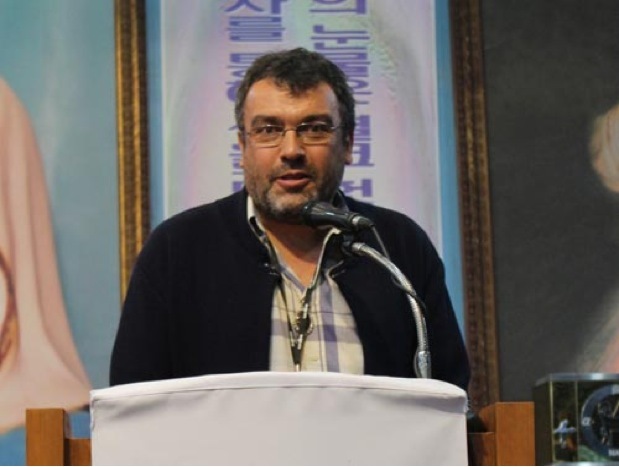 in the prayer meeting in Naju, Korea on September 7, 2013, a First Saturday. pray together before beginning the Stations of the Cross. Greetings to the Korean pilgrims! I love Naju so much that I am back to Naju for the third time. During the past 500 years, the Blessed Mother visited the world whenever the human race was faced with difficulties. 500 years ago, at Guadalupe in Mexico, she came and saved countless people from being sacrificed to the Sun god. Later in 1858, the Blessed Mother came to Lourdes, France and gave us a miraculous spring. 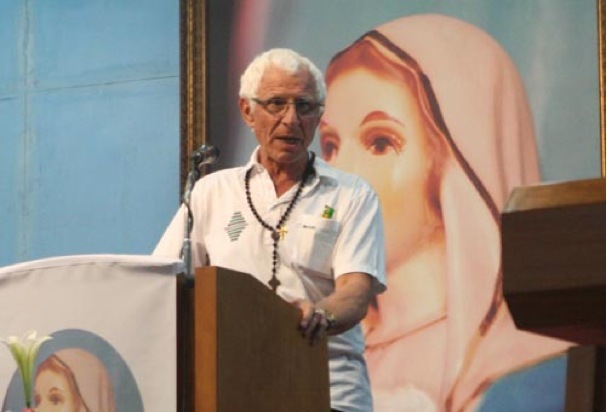 In 1917 when the Communist errors were spreading in the entire European continent, the Blessed Mother came to Fatima and checked and suppressed the advances of the Communist influences. In the early 1950s, she blocked the Communists from conquering South Korea. During the Cuba Missile Crisis in 1962, she came and prevented the outbreak of a war between the United States and the Soviet Union. Thus, the Blessed Mother has come to our world every time it is faced with extreme difficulties. 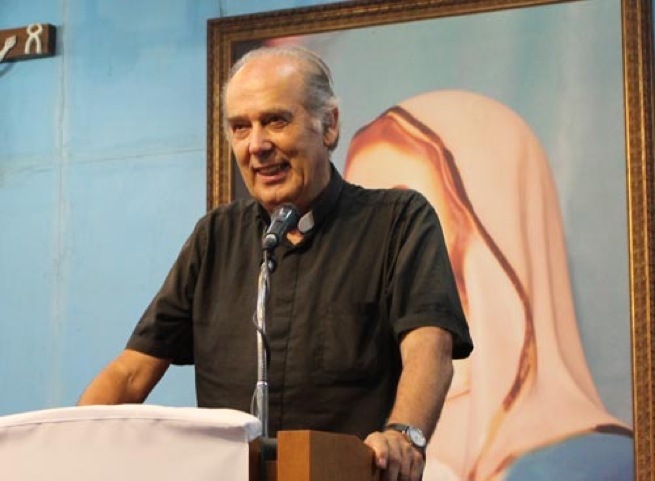 We have a very certain reason to rejoice, because the Blessed Mother again came to the world, this time to Naju, Korea, in 1985, as we are facing very difficult and dangerous crises in our time. 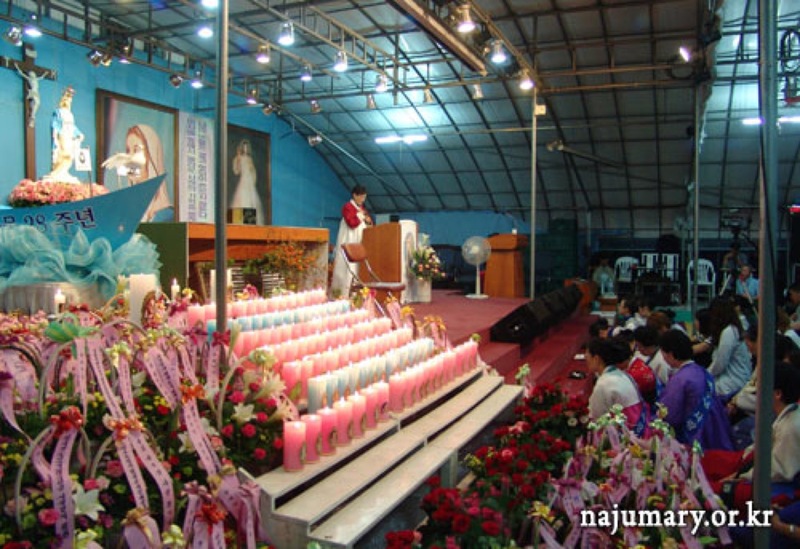 The Blessed Mother's Mountain in Naju is more beautiful, because Naju is an extension of Lourdes and Fatima. Rejoice! We can lead a happy life thanks to the special graces from the Blessed Mother, the Queen of Peace. 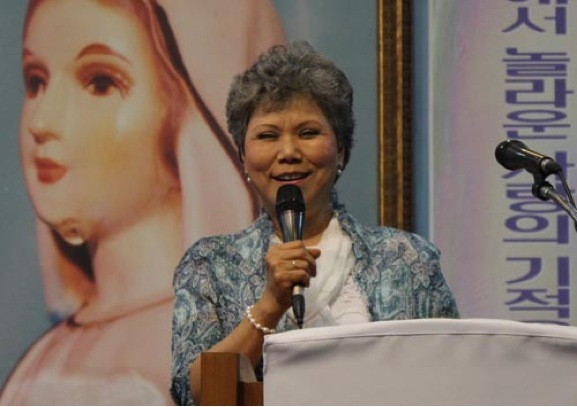 I am especially joyful knowing that there is Mrs. Julia Kim in Naju who continues to live as a victim soul to repair the sins in the world. Because God has especially loved Korea, His youngest child, He gave us this victim soul in Naju and this makes me enormously joyful and grateful. I hope is that the Holy Father will officially approve Naju soon, which is a source of life, so that its light may shine on the whole world. I hope that all of you receive much grace from the Blessed Mother today and return home and lead a life that is more conforming to God's Will. I am grateful to you, as I saw your firm and deep Faith and your love and adoration of the Holy Eucharist, which made me think a lot and learn a lot. I sincerely hope and will pray that the South Korea and the North Korea will have one heart in the Immaculate Heart of the Blessed Mother and unify the country in a peaceful way. This is my first visit to Naju. I have heard that the Naju Investigation Committee of the Gwangju Archdiocese has not conducted an objective and thorough investigation. As you know, it takes a long time to investigate and discern the reported apparitions and formalize the conclusion. 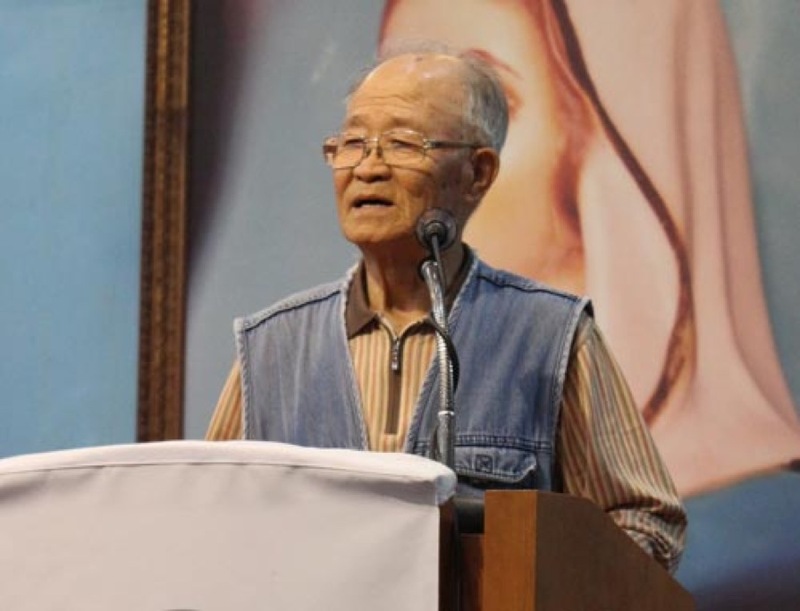 I hope that an unbiased investigation committee will be organized and a true and unbiased investigation will be carried out regarding the Blessed Mother of Naju. 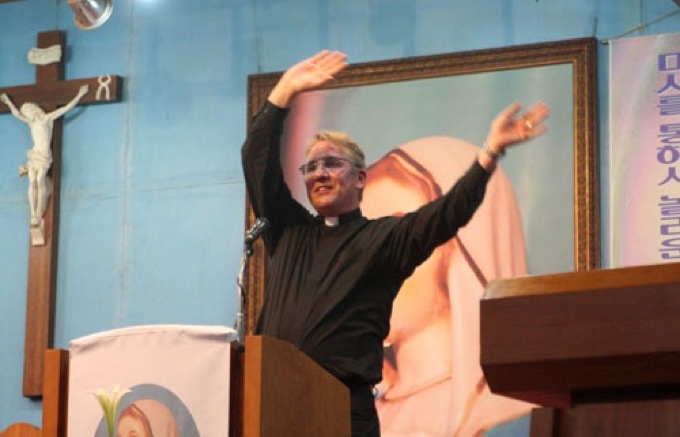 Even though this is my first trip to Naju, I have already observed how the many volunteer helpers speak, act, and pray, which have made me realize that they are walking with Jesus and the Blessed Mother in everything they do. I ask you for something. 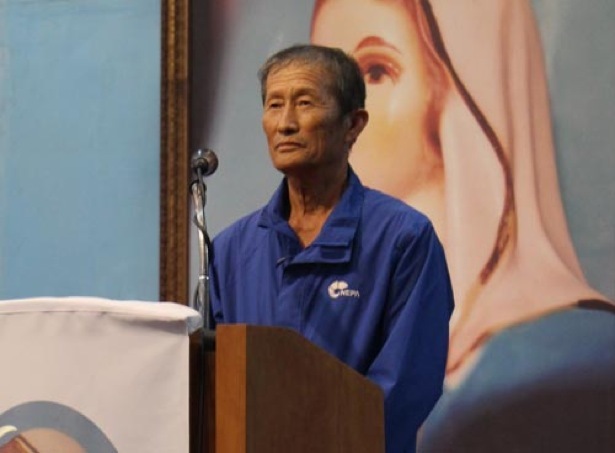 In the Messages of Love, the Blessed Mother of Naju has repeatedly asked that people pray for the sanctification of the clergy. Please pray a lot for us, the priests. Only when the priests accept the Messages of Love and reform their hearts and lives, the Church will be able to firmly stand on the rock. I also eagerly hope that the South and North Koreas be unified. We have already experienced the process of unification of the West Germany and the East Germany. However, the German people have not given thanks to God for the unification. On the contrary, when Korea is unified, I am sure you will give lots of thanks to God. Lastly, I hope that Naju will be officially recognized as soon as possible. Together with you, I will pray unceasingly for the Church recognition of Naju soon. I want to give you a gift of a song. (Fr. 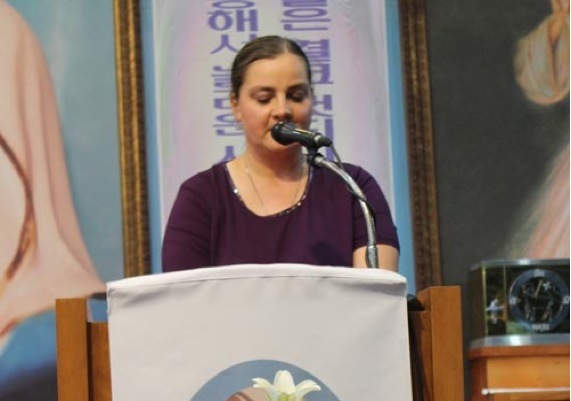 Fohl sang the song: "The Mary's Ark of Salvation" in Korean.) Thank you. 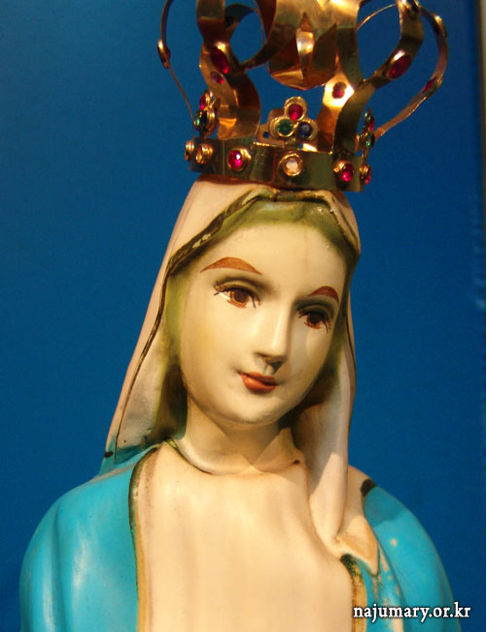 In Faitma, Portugal, the Blessed Mother said, “In the end, my Immaculate Heart will triumph.” Therefore, the Blessed Mother of Naju will surely triumph. There were some difficulties in my coming to Naju this time. But I came here thanks to the Blessed Mother’s help. I am so happy and grateful. I saw many things during this pilgrimage. Especially, your humility gave me a very deep impression. I sincerely hope for the unification of the South and North Koreas. If we ask the Blessed Mother, she will obtain it for us without fail. Glory be to the Lord! I am a registered nurse. I visited Naju for the first time in 2011 and received a very good and beautiful impression, and therefore I came back here. I remember how devotedly you prayed sending so much love and adoration to Heaven and how you were kind, loving, and friendly to us, foreign pilgrims. During the current pilgrimage also, I am receiving the same good impression. I will always remember it after I return to Austria. Thank you. I am an Italian and contacted Mrs. Cäcilia Pohl through a friend of mine in 2006. In that year, I made my first trip to Naju. The current trip is my third visit to Naju. Since my first visit to Naju, I have been spreading the pamphlets about Naju published by Mrs. Cäcilia Pohl all over Switzerland. I feel this is very worthwhile and I am so grateful, as it is a work for the Blessed Mother. There were some difficulties in coming to Naju this time, but I am glad that I decided to come. I thank to Mrs. Julia Kim who is so loving and to others who are also so kind. Our pilgrimage group from Europe visits Naju in September every year. Wherever we went in Korea, people curiously asked us, "Where are you from?" "Why did you come here?" Many of those who asked us these questions were Catholics. Our answer to these questions was, "We came here to visit the shrine in Naju." During this visit, one person in our group suddenly became sick and was taken to the emergency room of the hospital belonging to the Jeonnam University. 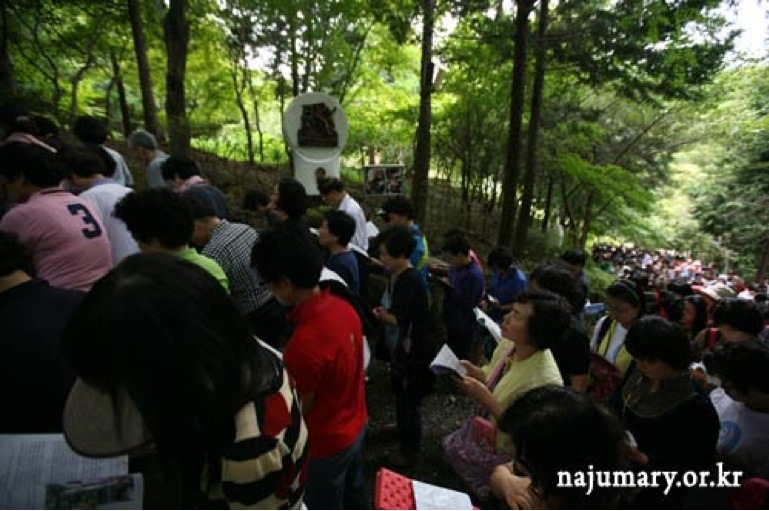 Even there, we informed the doctors about the Naju shrine. In the special village of the Korean Tradition in the City of Soonchun also, we told those who work there about Naju. 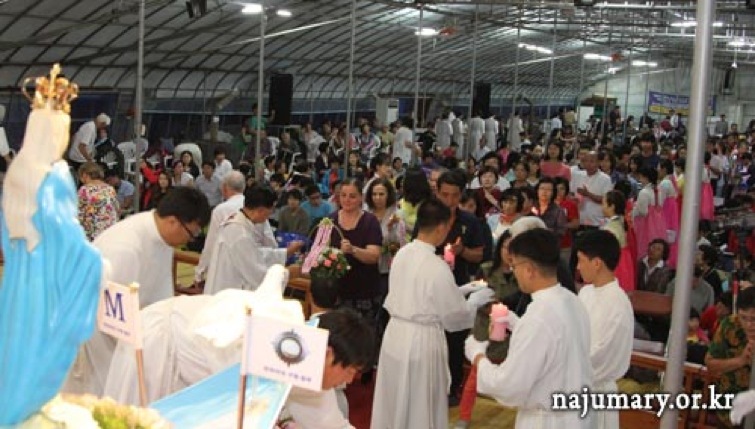 We have heard that the Gwangju Archdiocese sent a letter to the Bishop in Kenya, Africa, asking him to prohibit the people there from making pilgrimages to Naju. My friends! Never be overpowered by such news. In Europe, a Cardinal who knows the situation in Naju supports our promotion of the Naju information. 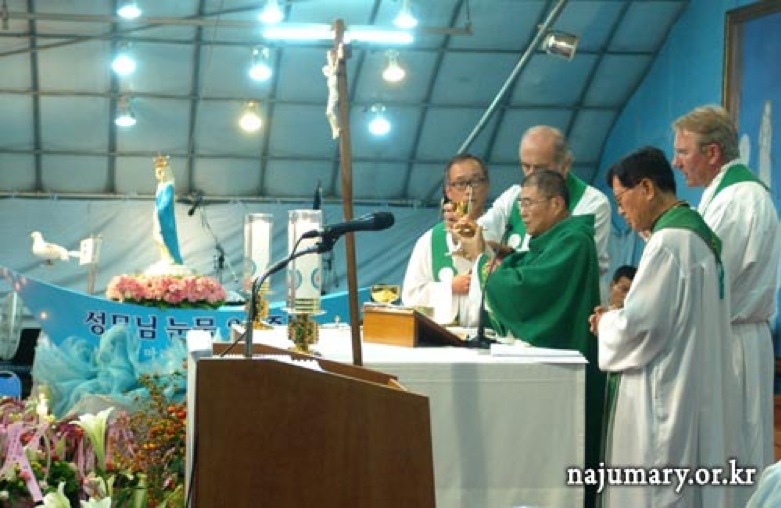 There are many Bishops and priests in the world who support Naju. My friends, the Gwangju Archdiocese continues vigorously spreading the false rumors and accordingly some Bishops and priests (in Korea) are doing injustice. In such times, we should have the courage to say "That is not right!" 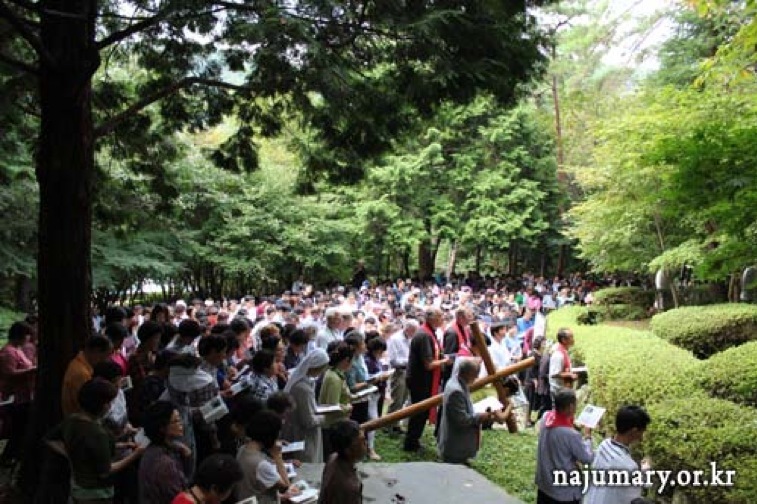 Some people say, "I will make a pilgrimage to Naju when it is officially recognized." If we remain silent even when we see injustice, our faith is dead and we are not rightly serving Our Lord. At this time, Our Lord needs our mouths and hands and feet. My friends! Pray hard for your priests. At the same time, you must act. If we only pray all the time, who will do the work? Priests can always lead many of the souls in the direction they go. Are you going to keep your mouths closed even when the priests take the lay people to a cliff? No! You must be courageous and say, "Father, please do not go any further in that direction. You and your followers will all fall." Yesterday, while we were eating at a vegetarian restaurant in Gwangju, several Sisters saw the two priests at our table and rushed to us. I asked them, "Where are you from?" Sisters answered, "We are from the Gwangju Archdiocese." I said, "The Gwangju Archdiocese must repent." The Sisters were startled and said, "Why?" 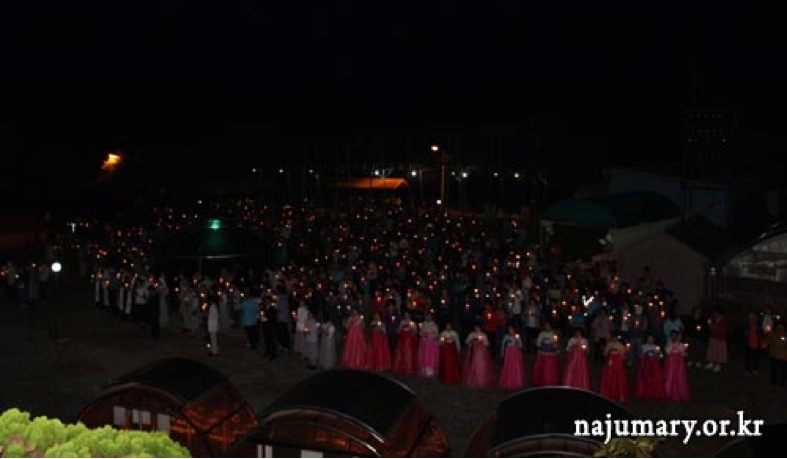 I answered, "We came here to visit the shrine in Naju, but the Gwangju Archdiocese has never investigated a witness like myself regarding the Eucharistic miracles. Why is the Archdiocese spreading false rumors and lies without even interviewing the eye-witnesses?" Actually, on February 28, 2010 in the Vatican when a Eucharistic miracle occurred, I was sitting right behind Julia Kim in the chapel. Archbishop Giovanni Bulaitis gave the Communion to Julia in the form of Bread and Wine and then to me. In front of our eyes, the white Eucharist that Julia received was changing into Flesh and Blood on her tongue. I was so strongly moved and was only crying. After telling the above to the Sisters, I added, "As you see, an eyewitness of that Eucharistic miracle is alive like this, but how can the Gwangju Archdiocese continue telling the lie that the Eucharistic miracle was fabricated even without any qualms in their consciences?" The Sisters could not say any words. I know well that the Gwangju Archdiocese prohibits you from going to Naju and continues their persecutions of you. However, when you come to Naju next time, do not just bring two persons but bring ten people per each of you. If pilgrimages do not cease but continue like this, the official recognition is a matter of time. Even if they try to cover the light, the light is bound to leak and shine. 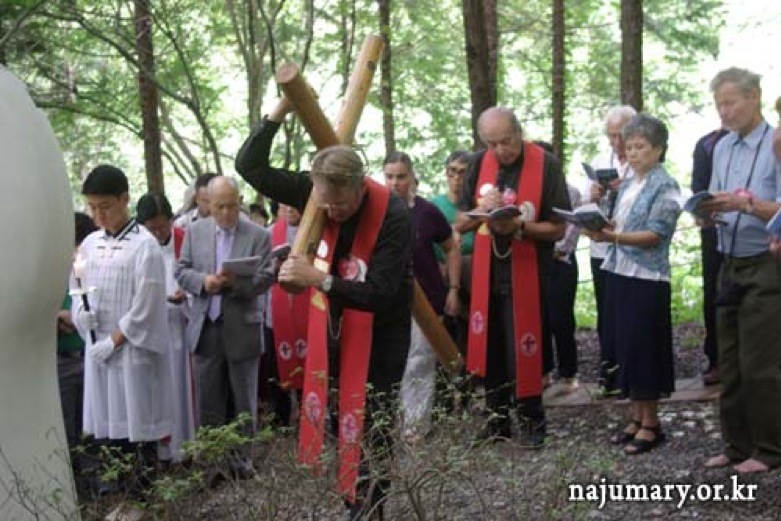 Please pray a lot that the promotion of the Message of Love of the Blessed Mother of Naju will expand and reach many people in Germany and the whole Europe. Also, please pray more for the priests and for the repentance of the Gwangju Archdiocese. Thank you. I had suffered from the enlargement of the prostate gland for a long time. I had visited the hospital many times, but it did not help. On the First Saturday of December 2012, I was healed of it through the grace that I received in Naju. Also I had suffered from some damages to my spine and hips, but I was healed of these, too. I hope that you may also be filled with love and be healed of all kinds of illness. Thank you. Good evening! I have made pilgrimages to Naju more than ten years until now. My son is a doctor and gave me a medicine for my hypertension. I had taken that medicine for many years. Then, about six years ago, I forgot to bring that medicine with me when I was coming to Naju. So, while listening to Mrs. Julia Kim’s talk, I responded with “Amen!” again and again. I was expecting my blood pressure to go up, as I did not take the medicine. But my blood pressure was not rising. I decided to stop taking the medicine completely. My son was worried and urged to continue taking the medicine. But I had trust in the Blessed Mother and have not taken the medicine for the past six years without any problem. I have received many graces in Naju. Thank you.